NOTE: We have added a few more Wawona parts to the feature below since first it was posted, in part because our first efforts were interrupted with a closing or crash of this blog. This happens often, and we wonder if we might not be involved in some lukewarm version of a protection racket. Our server tells us that they cannot figure out why it stops, but for a such-and-such more they will keep a close eye on it. They have, it seems, a category of service where one’s site is always on a cusp of working or not working. Or perhaps we are simply special and almost no one dances to the same crash and come back beat. We are welcome to any suggestions or references that will lead us to a reliable server; that is, one with no such special categories. The primary photo for this feature – printed just below – somehow got removed (probably by me: pd), but we have brought it home again. 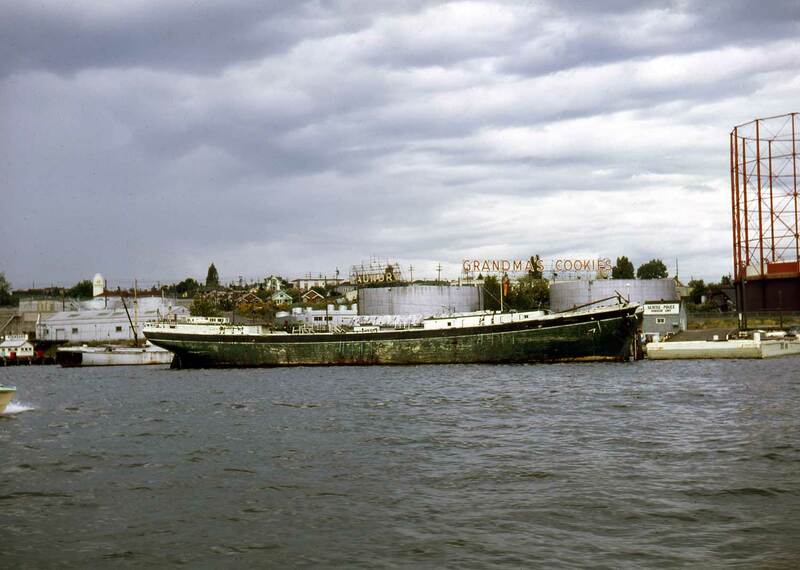 In 1964 Ivar Haglund joined Kay Bullitt and Seattle City Councilman Wing Luke in founding Save Our Ships (S.O.S.) and donating 27 thousand dollars towards purchasing the Wawona from a Montana rancher whose urge to haul cattle on it had passed. On the way to its final moorage at the south end of Lake Union beside the Center for Wooden Boats, the Wawona visited many Seattle slips, saltwater and fresh. 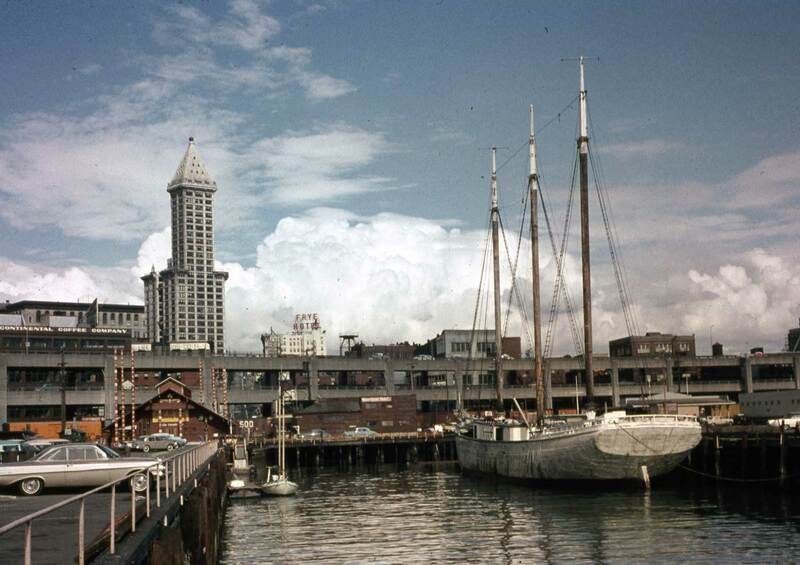 In the summer of ’64, Fire Chief Gordon Vickery agreed to switch the berths for his two fire boats at the foot of Madison Street so that the larger one, the Duwamish, would not prevent the schooner Wawona from resting beside pier 54, and so directly below the plate glass windows of Ivar’s Acres. Several local artists came aboard and turned their artful hands on the vessel. We can see several of them at work above in Frank Shaw’s photo. The results were sold on board in an art auction with the funds going to the schooner’s preservation fund. 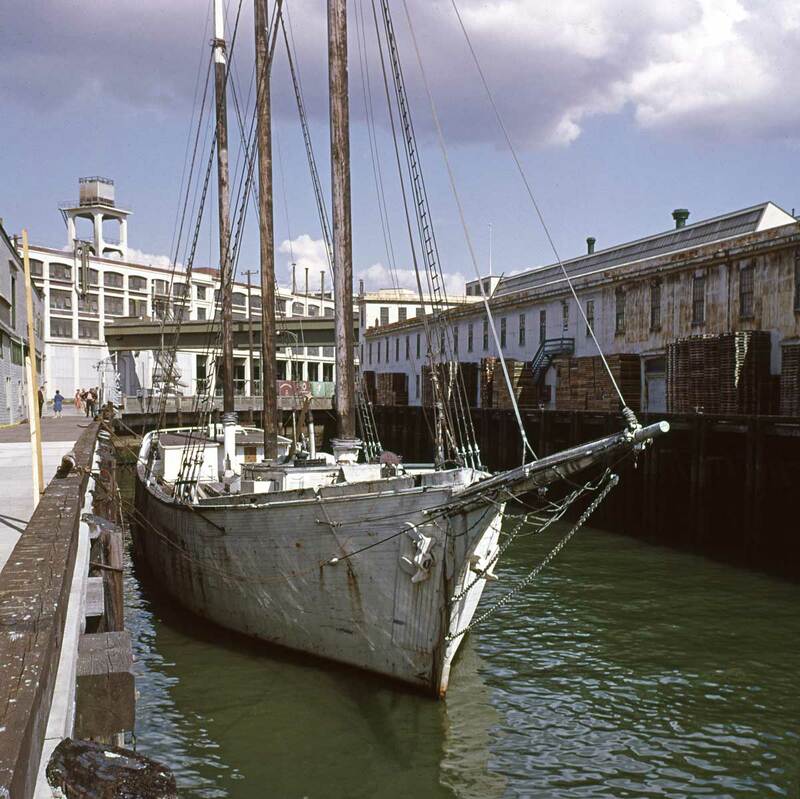 In 1970 the Wawona became the first vessel to be listed on the National Register of Historical Places. Through these years the “museum ship” was embraced and improved by many local carpenters but they ultimately could not keep pace with the rough handling of nature. Always hoping for more pocket help the schooner went bad faster than it got better. 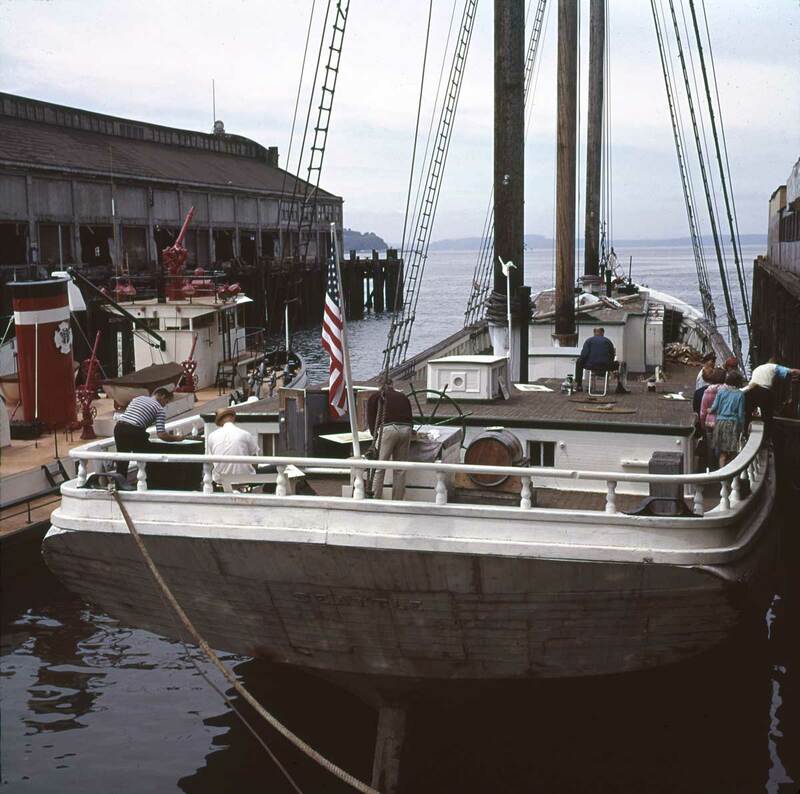 After his first contribution in 1964 Ivar returned to the schooner in 1980. The Seattle Times writer Walter Evans, on his man-about-town beat, made note of Ivar’s new oblation in the issue for Jan 17, ’80. “Ivar went to the bar and came up with a concoction called the ‘Sail Away’ created by Carlos Botera of the Captains Table. It contains guava nectar, papaya nectar, strawberry preserves, orange syrup, light rum and 151 proof rum. You get to keep the cup and the hangover when you order it, and the cash you pay for it, $2.50, goes toward restoration of the historic sailing schooner, Wawona.” This call for aid from the city’s stiffer drinkers could, of course, not revive a campaign to save the schooner. Like perhaps some of those who tried to help out by ordering many rounds of Sail Away, it too fell flat. 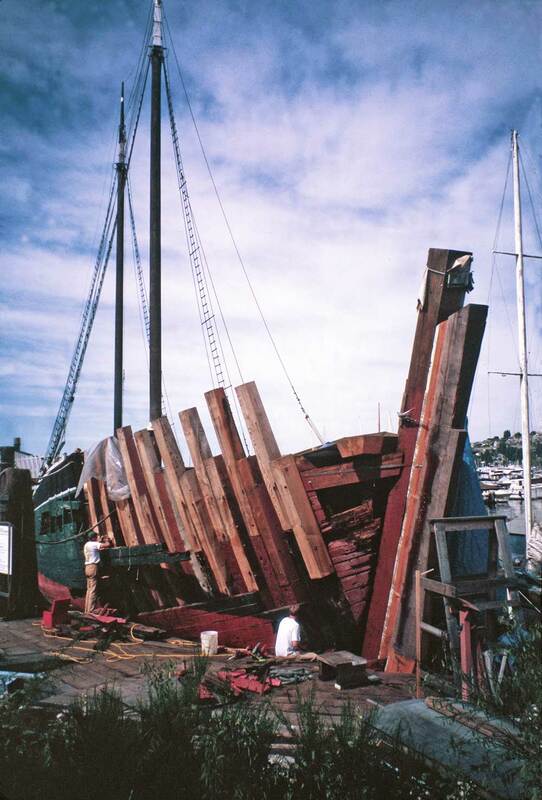 During the spring of 2009 the Wawona was towed from the Center of Wooden Boats at the south end of Lake Union to its destruction somewhere out of sight. Resting in the slip between American Can on the right (the future Port of Seattle pier) and Pier 70, on the left, it was from here, most likely, that the Wawona was towed to Pier 54 for its weeks of raising funds for itself. Frank Shaw dates this June 14, 1964. The Wawona when still a working schooner in the slip south of the Port of Seattle's Bell Street Terminal, seen here in background haze. I do not know the date. This profile of the Wawona at the Gas Works - before the park - is neither dated nor attributed. It comes from a mixed collection of slides recorded by Lawton Gowey and Robert Bradley. Slowly I am sorting them out - but not this one yet. I see that the green paint is in poor shape, but I also note that it was green at the end. There are enough Wallingford landmarks or features in this to most likely date is close - after some reference work. Nice sky. I seem to remember the Wawona being here ca. 1970 when Stan James was doing some carpentry on its Captain's quarters. Clay Eals pointed out this post to me. Thanks so much for creating it. I had not seen the color photos of Wawona painted white. The black and white photo is almost certainly pre-World War II. When the war started, she was requisitioned by the army and her bow and mast cut. 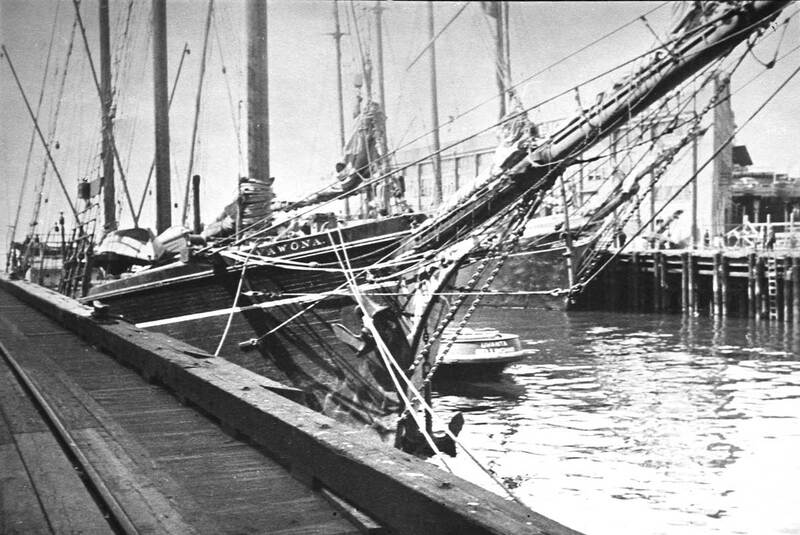 After the war, new masts were stepped and an ugly steel bowsprit installed. That’s what you see in the color photos. Thanks Joe for the info. It is rare to share with you something of the Wawona that you have not already known or seen.